Today is my birthday, y’all! 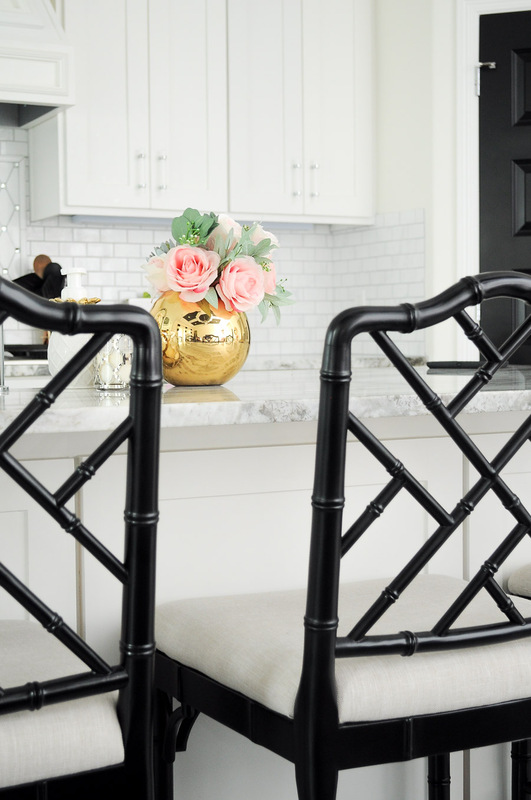 And I figured there was no better way to celebrate on the blog than by hosting a week-long spring tour with 24 other bloggers and sharing my own home today. 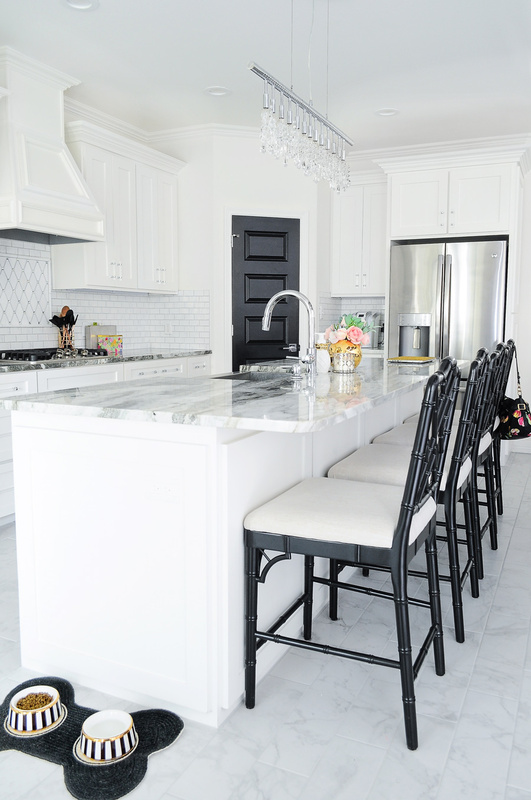 There’s 5 tours a day, and the Monday-Wednesday spring tour of homes posts have provided me so much inspiration and eye candy, so I hope you will click around via the links on the bottom of this post. The tour left off yesterday with A Home to Grow Old In’s gorgeous tudor home! I’m obsessed with her home. 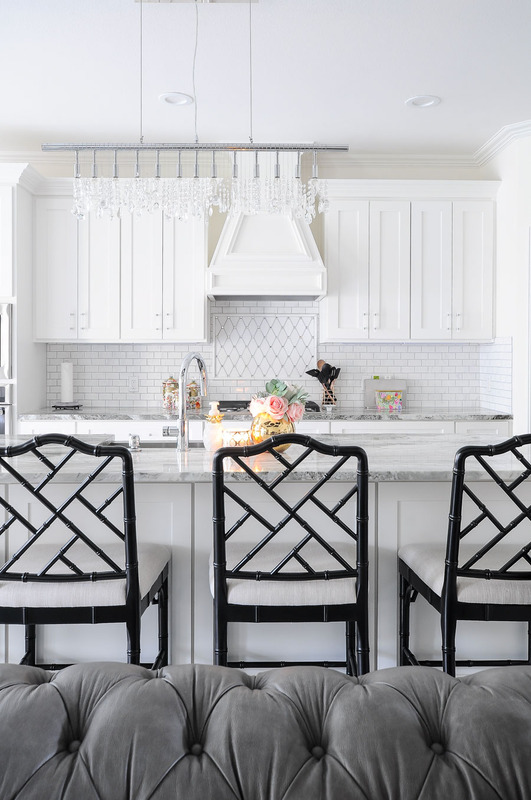 I typically do a lot of explaining in my home tours, yet I know most of you are just here for the pretty pictures, so I’m going to tone down my yapping and give you more photos. 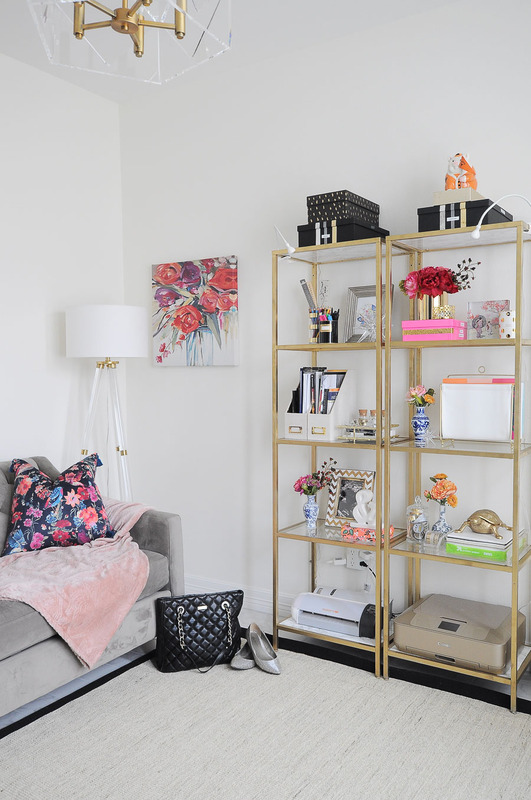 I used a lot of what I already had on hand for my tour in terms of decor, and I amped the florals more than usual. I hope you enjoy, and there’s no greater gift to me on my birthday than you taking time to read my blog, so thank you! xo. In the foyer I placed 99% of my blue and white decor on here. 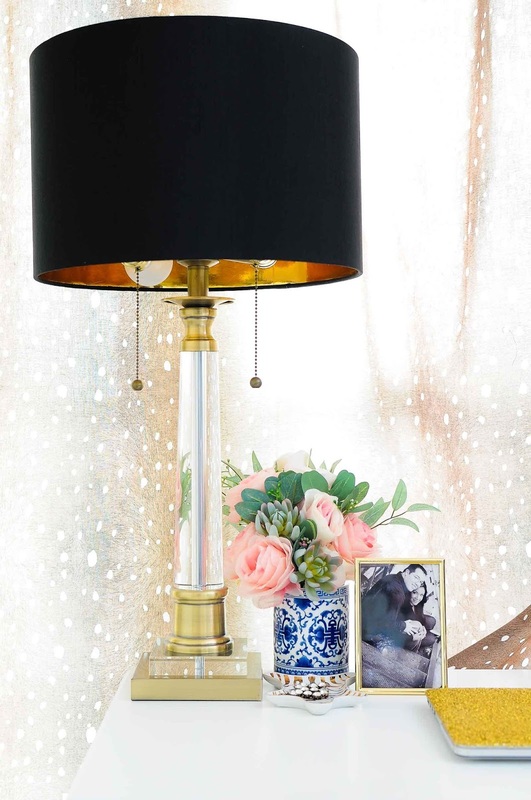 I am a huge fan of similar items in a large collection because it looks grand and chic. Plus, I had a nervous breakdown trying to make these pieces work in the living/kitchen/dining area, so this approach made my life easier. Once decor makes me flustered, I know it’s time to take a step back and pare it down. 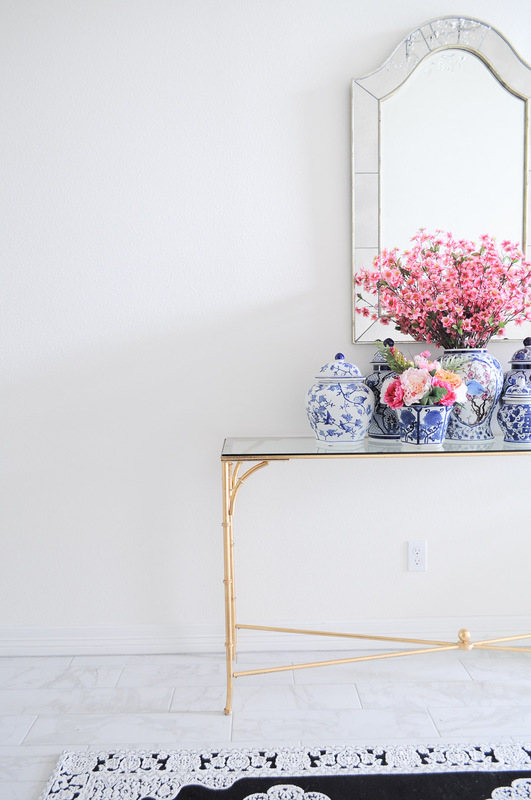 I had that huge ginger jar with the pink apple blossoms on my island for almost a month, and truthfully I kept having to find creative ways to place it so it wouldn’t block the TV when I was cooking or washing dishes. I decided to keep it simple and clean in the kitchen. I cook 4-5 nights a week, so I prefer functional with a dash of decor. I got some comments via IG that my kitchen looks “cold”, but I simply don’t like a lot of clutter in this space and we have a large pantry and plenty of cabinets to store stuff in. 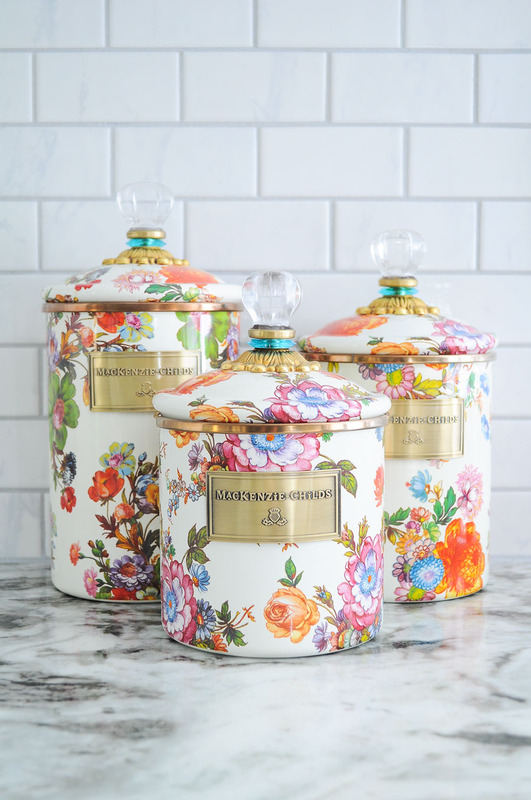 These gorgeous floral canisters are one of the few canisters I keep on the counters at all times. They’re too pretty to keep in the pantry, so out they stay. 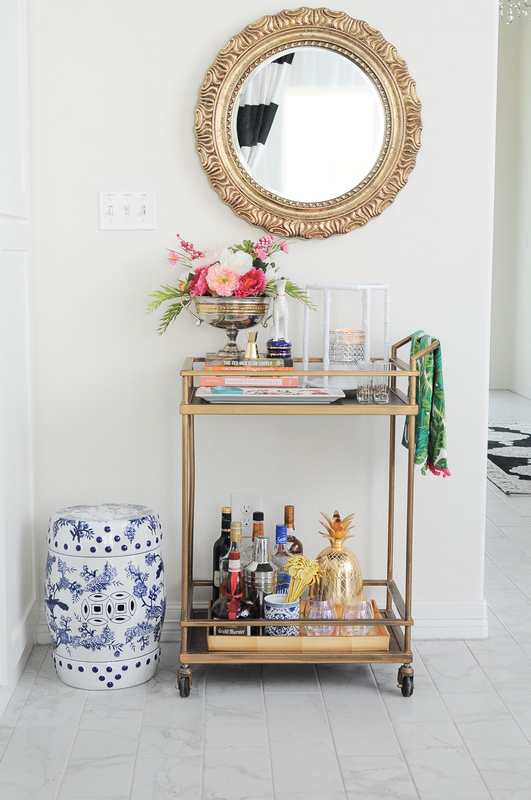 Decorating my bar cart is truly a delight each season, and I did a whole post about it last week if you want to check it out for spring bar decor ideas. I will include a few pics below because it’s too pretty not to share. The living room is a work in progress… we bought a new chesterfield sofa that WE LOVE, and we’re living with the brown leather recliners until we figure out what chairs we want. Also got a new rug, and our TV stand is from my very short lived reclaimed wood phase and will be replaced in 2018 sometime. I’ve strategically left most of this view out of the photos since it’s not very pretty, truth be told. And my striped curtains. I love them! 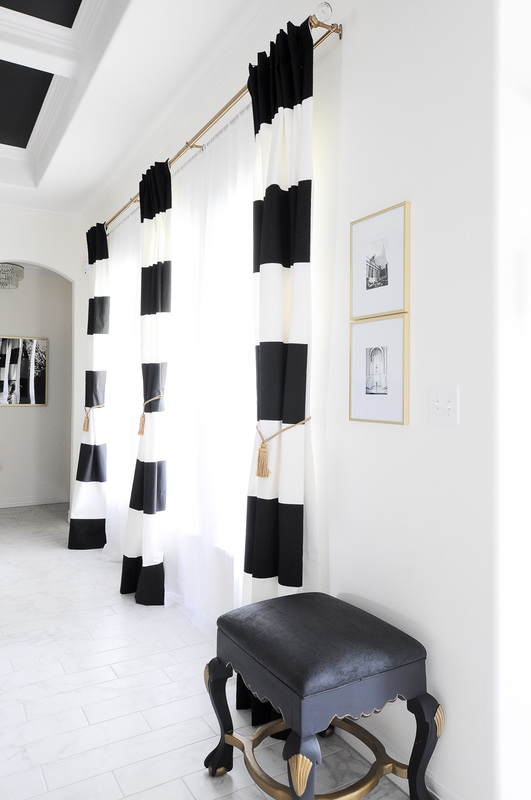 I may get some simple white drapes for summer just to rotate the curtains out since the sun beams right on them. 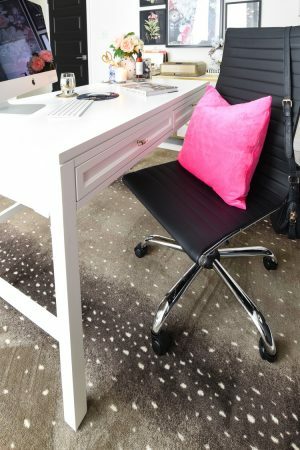 Found a great spot for my painted black bench from my office makeover. Even the fabric is painted, which I wrote about in this DIY painted ottoman tutorial. Brass frames hold some black and white photos I took during the last time I was in NYC. I love that city! Around the new year, we stumbled upon this beauty at HomeGoods and brought it home. 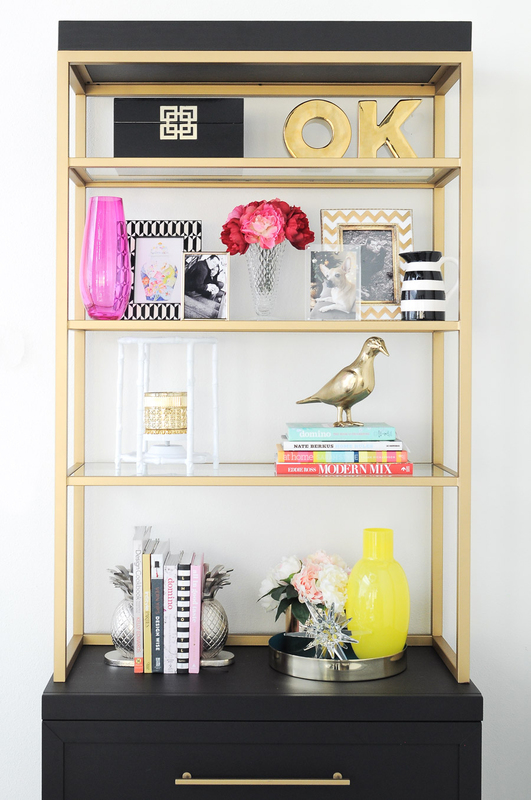 I love decorating the shelves, although they’re not very tall so sometimes it can be a bit challenging to fit decor in them. 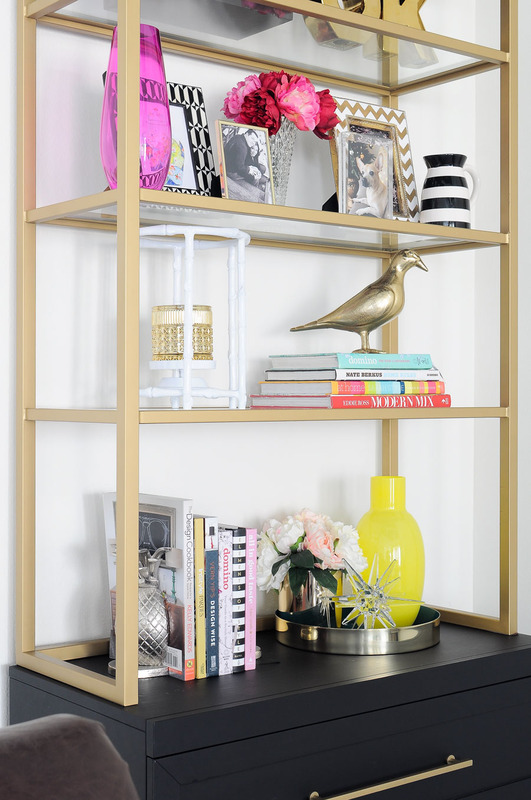 I initially styled the shelves very eclectic in this how to decorate bookshelves post, and now it’s bit more spring-ified! In January as part of the $100 Room Challenge, I made over our small dining space/room into a black, white and botanical dining space. 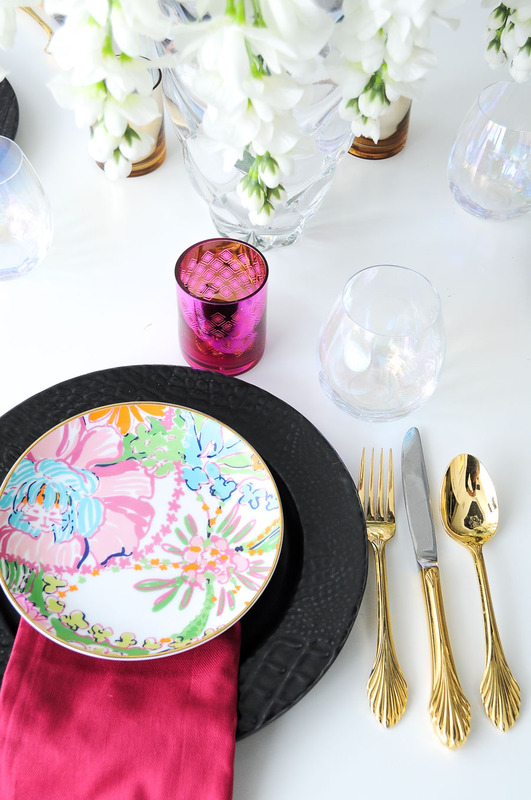 Not much changed in here, but I did liven up the table with some of my favorite bright plates and decor. The black campaign valet/bar stand also got a few changes to add some more color to the space. Also in January (I was insane and redid two rooms at once!) I gave the office a mini refresh. The space is pretty much identical to the photos I posted in the reveal a month ago, but here’s two of my fave pics. 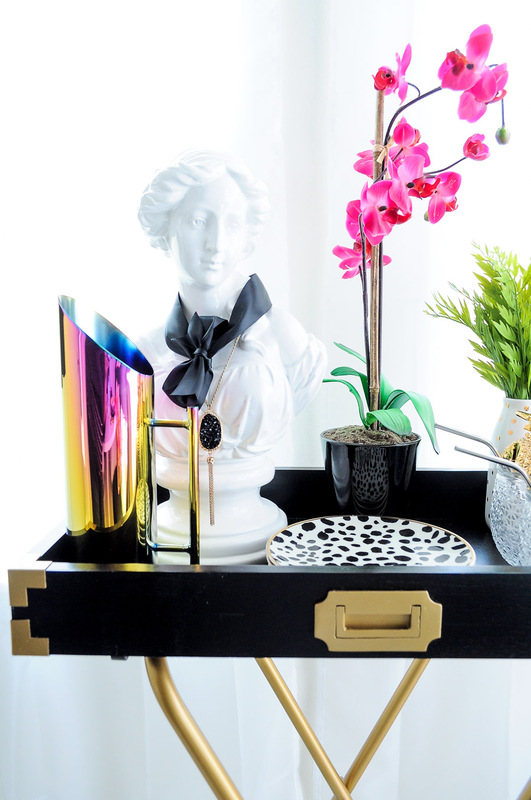 If you want to see more, check out my bright white and gold feminine home office reveal. Affiliate links may be included in the links below. Thanks for your support! And that’s a wrap! Whew. 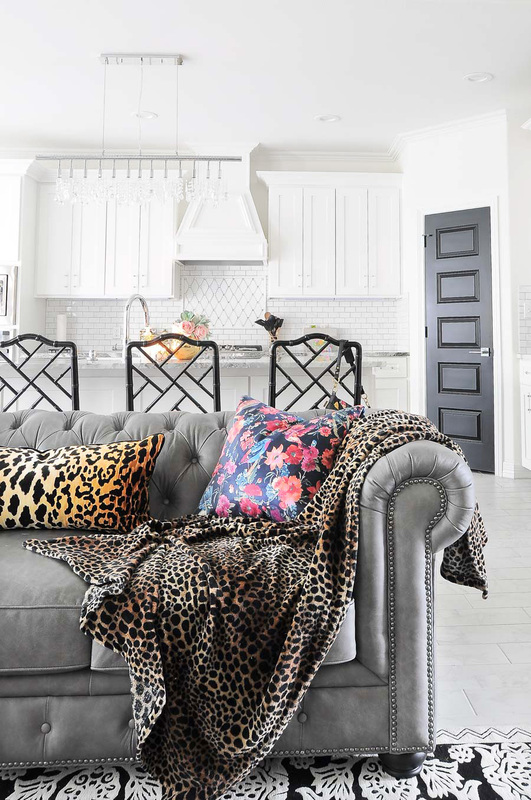 I know that was a ton of photos and I didn’t even delve into front porch, patio or bedrooms…mostly because none of those spaces are blog ready yet. Eventually they will be, and you all will get to follow along the process on the blog. I started on the master bathroom this week, and I’ll be starting the master bedroom on April 4 as part of the One Room Challenge. I’m a busy gal! I now hand you over to my friend Jewel from Jeweled Interiors. She’s in a rental, moves in 4 months and is STILL knocking out room makeovers like it’s no one’s business. 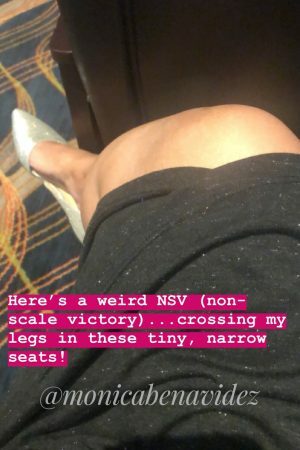 I love her style, and I’m sure you will, too. 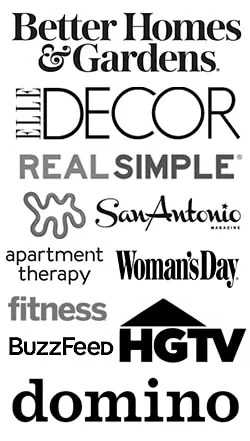 The full tour line-up is below, so click around and take in all the decor inspo! I’m off to enjoy my 33rd birthday. Gorgeous home, Monica! 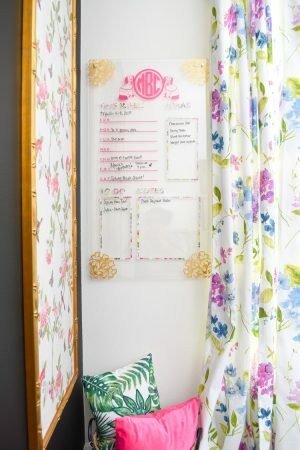 I love all the pops of pink floral. 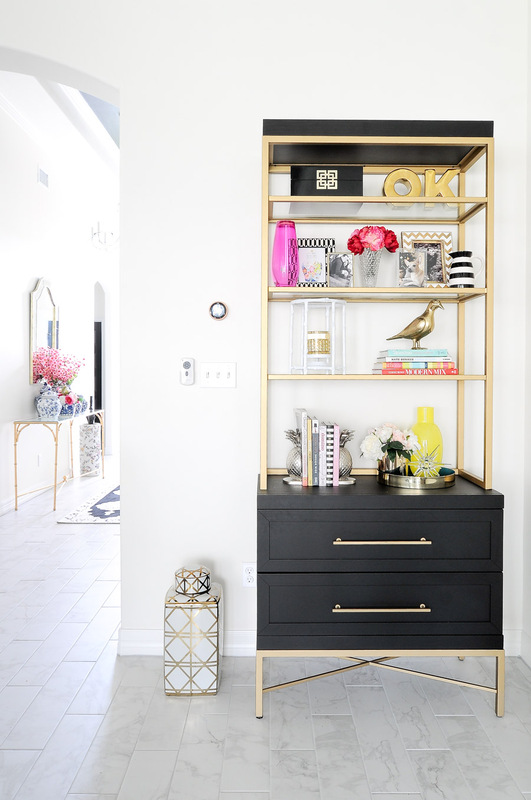 Love the mixture of golds and blacks too! Everything is so chic and stunning Monica! 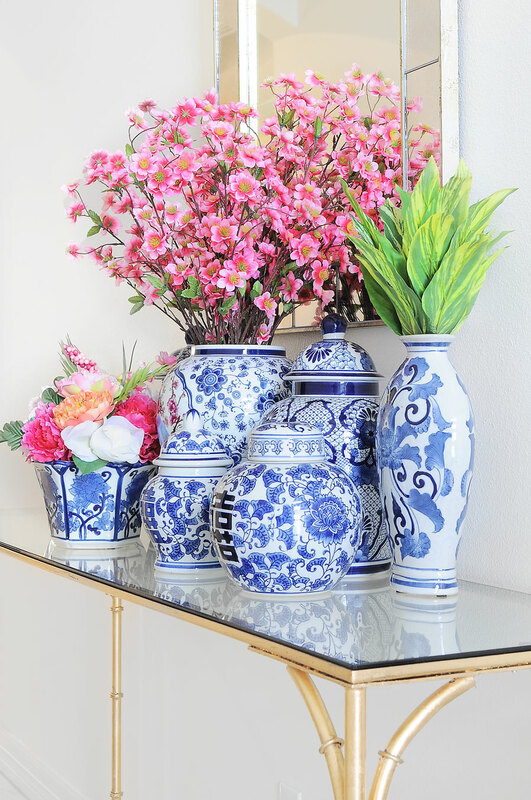 Loving your new bookcase, all the blue and white together in the foyer, and the simple gold vase and floral arrangement in the kitchen. 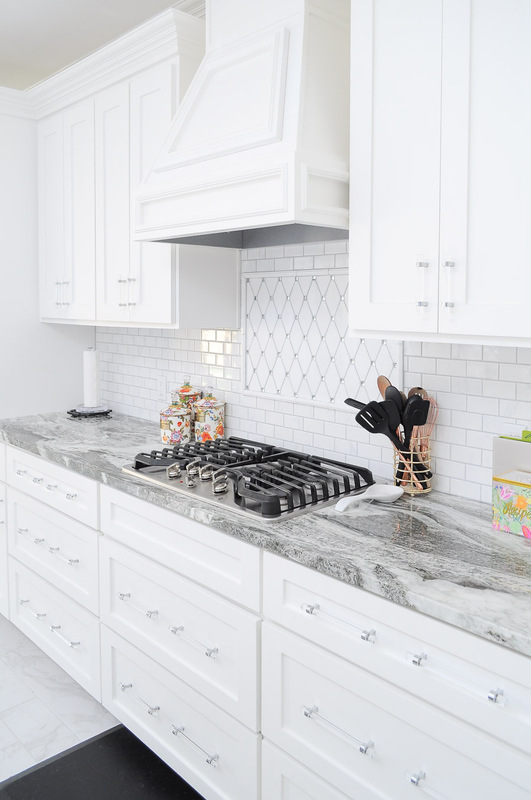 I don't think people understand that your home is full of color and warmth and there's no way you would feel like the kitchen is too sterile if they were in it. Boo for those comments! 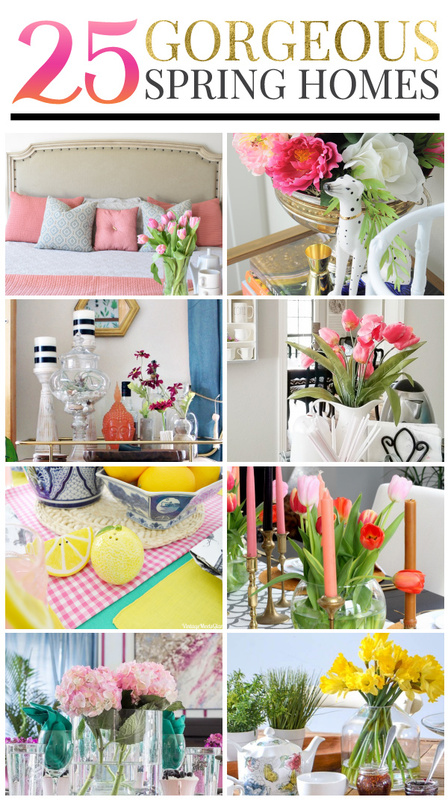 Thanks so much for organizing this amazing Spring home tour blog hop. I'm so happy to be a part of it! Monica, your home is so sleek and fresh—I'm in complete awe!! 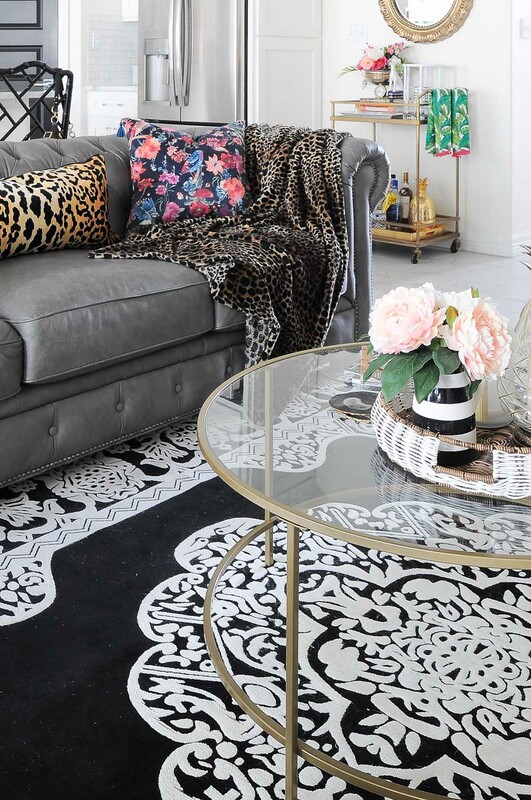 I love the starkness and contrast of your collections … just an incredibly striking and well-designed home!! 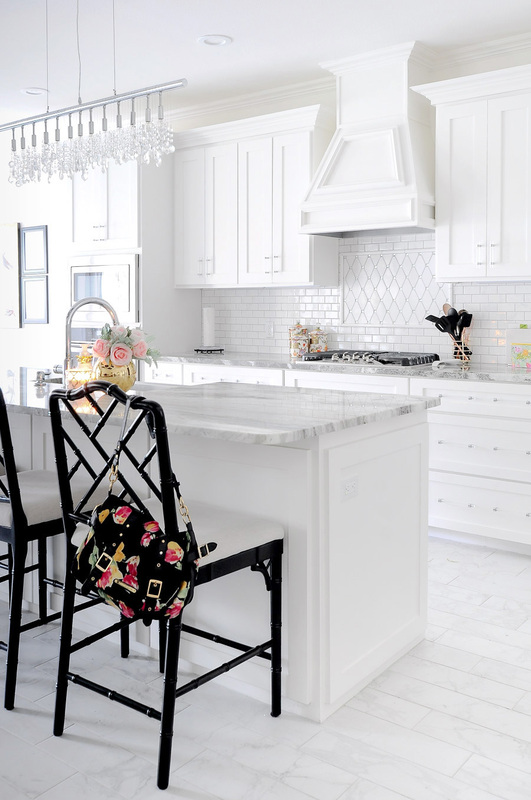 Love your spring colors against the black and white background and your kitchen is beyond gorgeous, so jealous. It all look amazing! Que BONITO!! I love your space and style so much. 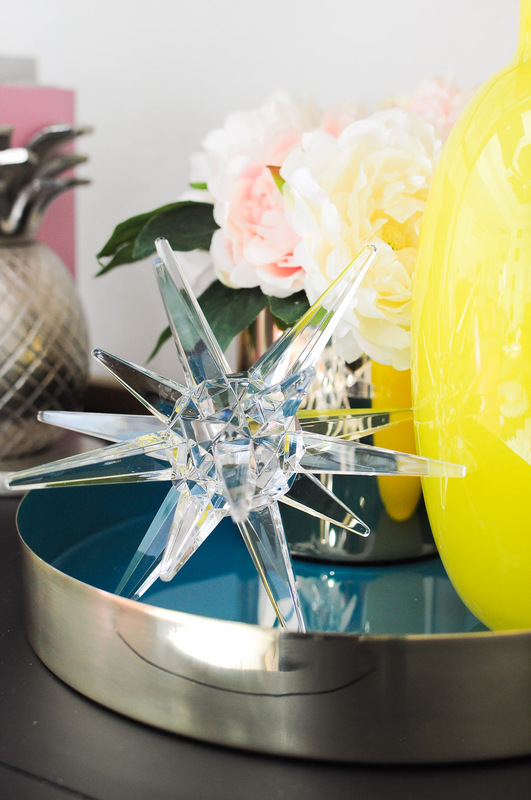 The kitchen hardware, the pops of spring color, the pillows. All of it! Everything is beyond gorgeous!! 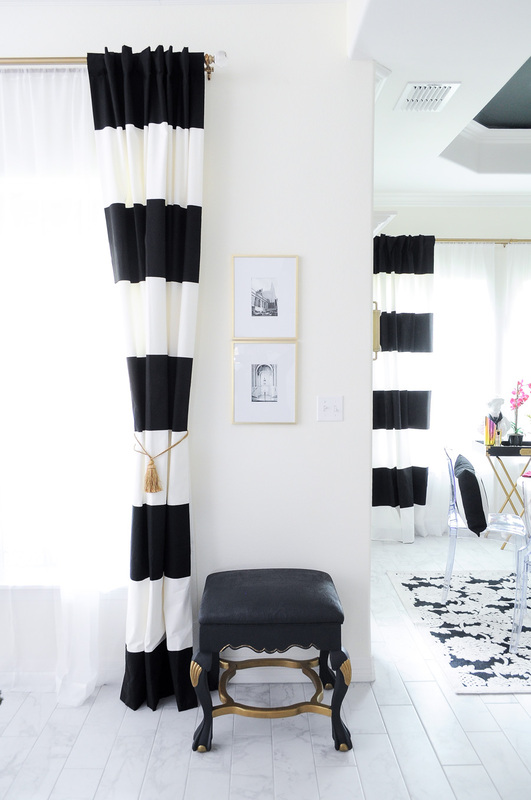 The colors with your chic black and white are so so perfect for the season! 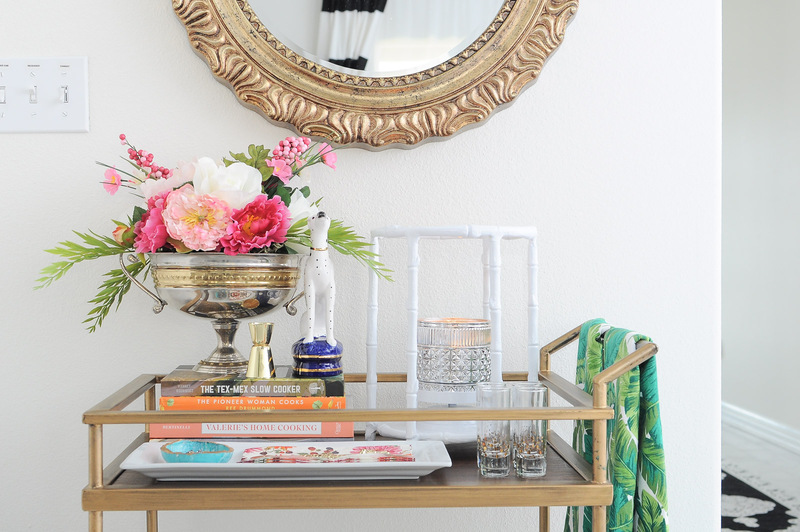 I haven't styled my bar cart yet for Spring, but you know its on my list 🙂 Thanks for hosting such a wonderful tour! And happy happy birthday week!! You have a beautiful home! Full of light. Gorgeous. Monica, I was dying to check our your tour yesterday but had no wi-fi! It was worth the wait, everything is so beautiful! 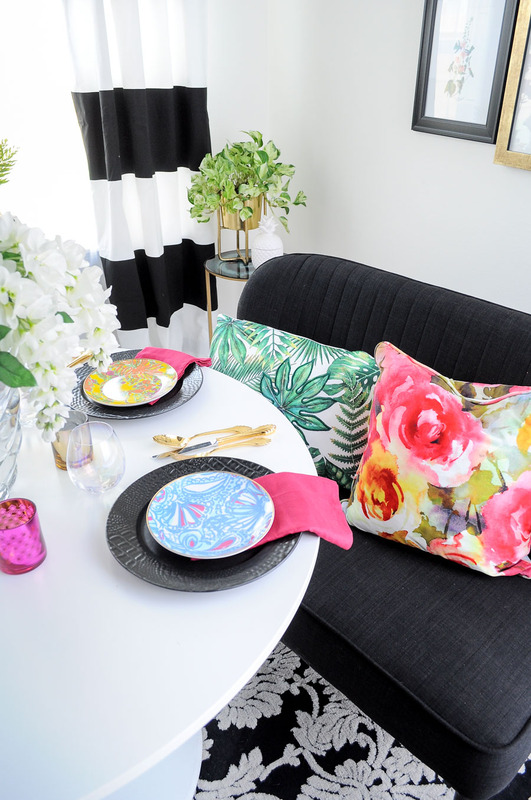 I love how your black and white base lends itself so well to changing up your home with the seasons – all the spring florals and pink look so pretty in here! You go all out! It's all gorgeous and I so enjoyed taking your spring tour, thank you! And hope you had a wonderful birthday!! You know I love your blue and white collection and those chippendale chairs!!! I have big time envy right now, love your home! Happy birthday!!! 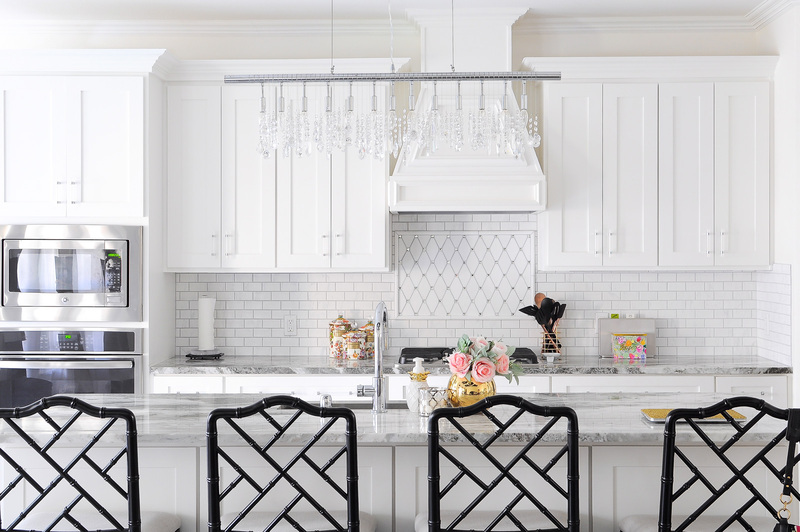 Wow, your home is just gorgeous, but I'm especially in love with your kitchen. 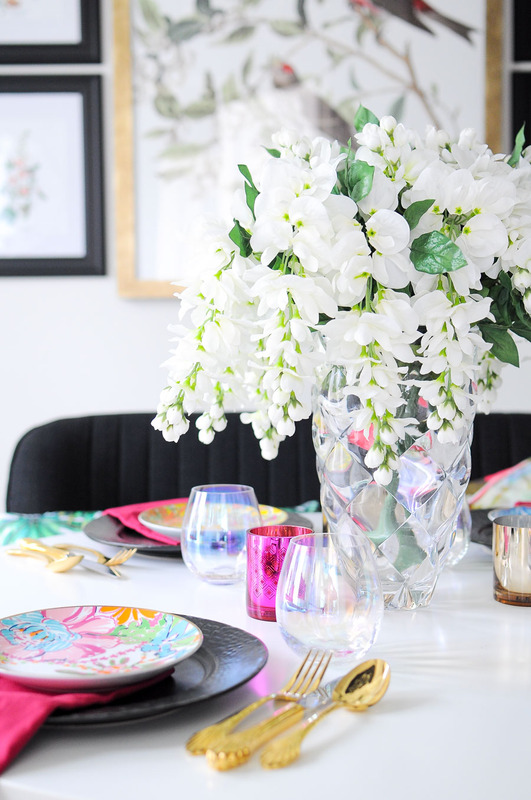 I'm trying to add more color into our kitchen, so those beautiful floral canisters may be finding a way into my home soon. This has been such a fun tour, and I'm so excited to be a part of it! Happy birthday. Your house is beautiful. I don't think your kitchen is sterile. It has lots of sparkle and texture. I wish I had space so my counters could be less cluttered. Your home is gorgeous Monica! I love the pops of color against the black and white. Thank you so much for hosting this tour! I love it. 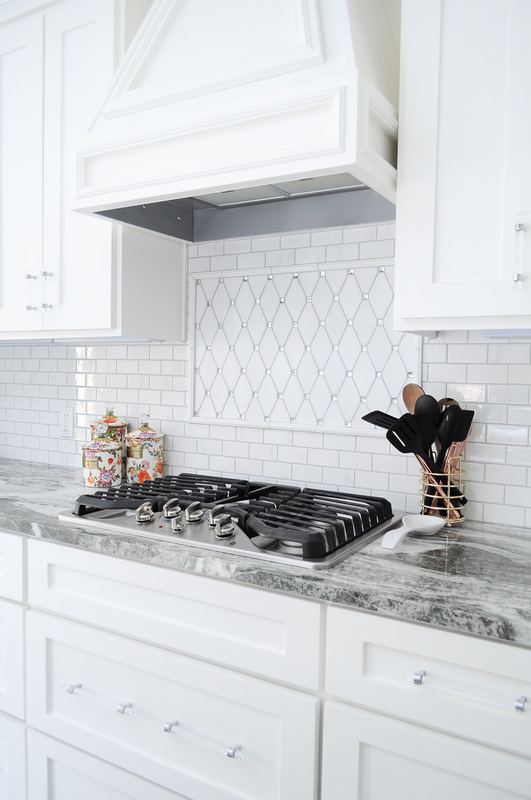 You have done such a great job of creating your style in your new home. Gorgeous. just gorgeous, monica! 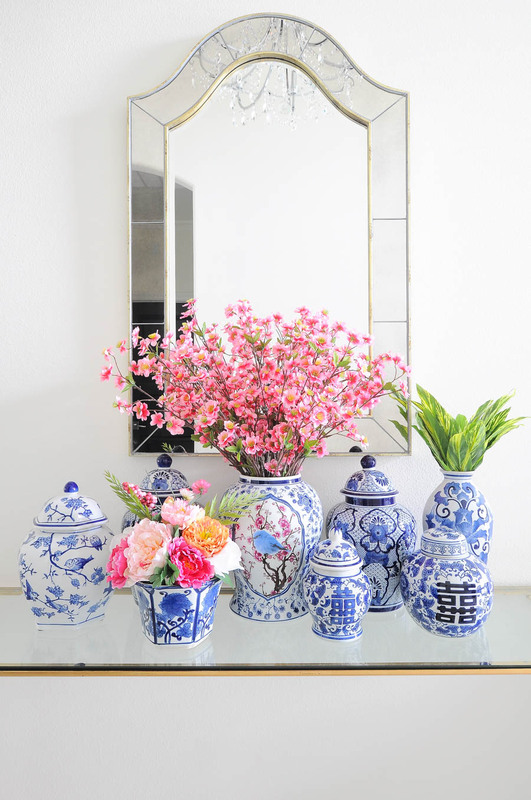 my favorite is the blue and white collection in the foyer- it looks stunning there! thank you so much for organizing this tour and including me!